Marker location: On FM 102, 2/10 mile south of IH-10 about four miles E of Columbus. Born as War clouds gathered. 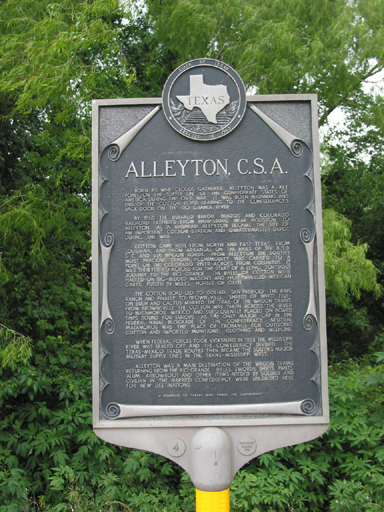 Alleyton was a key point on the supply line of the Confederate States of American during the Civil War. It was both beginning and end of the cotton road leading to the Confederacy's back door on the Rio Grande River. By 1860 the Buffalo Bayou, Brazos and Colorado Railroad extended from Harrisburg, near Houston. To Alleyton. As a railhead Alleyton became the site of an important cotton station and Quartermaster Depot during the War. Cotton came here from north and east Texas. From Louisiana, and from Arkansas on the Rails of the B.B.B. & C. and via wagon roads. From Alleyton the South's most precious trading commodity was carried to a point on the Colorado River across from Columbus. A point on the Colorado River across from Columbus. It was then ferried across for the start of a long, tortuous journey to the Rio Grande. The bales of cotton were hauled on big-bedded wagons and high-wheeled Mexican carts, pulled by mules, horses or oxen. The Cotton Road led to Goliad, San Patricio, the King Ranch and finally to Brownsville. Shreds of white fluff on bush and cactus marked the trail of the wagon trains. From Brownsville the cotton was taken across the river to Matamoros, Mexico and subsequently placed on board ships bound for Europe. As the only major gap in the Federal naval blockade of the Confederacy, neutral Matamoros was the place of exchange for outgoing cotton and imported munitions, clothing and medicine. When Federal forces took Vicksburg in 1863 the Mississippi River was sealed off and the Confederacy divided. The Texas-Mexico trade routes became the South's major military supply lines in the trans-Mississippi west. Alleyton was a main destination of the wagon trains returning from the Rio Grande. Rifles, swords, shirts, pants, alum, arrowroot and other items needed by soldier and civilian in the harried Confederacy were unloaded here for new destinations.